I am your stability, says the LORD. I Am the One Who holds you up and keeps you from falling. You will not reel to and fro or be unsteady on your feet, for you are rooted and grounded in Me. I have made you unshakable, though the winds of adversity are pressing violently against you. 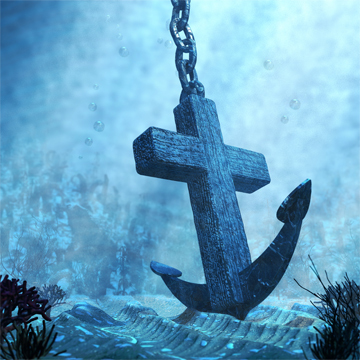 You are anchored in ME, and unmovable. I have kept you through every storm in life and covered you under My wings. You have been able to endure hardness, as I have equipped you to stand. Do not fear the sudden storms, says the LORD, for they are no different than the ones you see brewing on the horizon. For they will not hinder you from reaching your destiny that I have ascribed for your life. I have prepared you for the unexpected, and you will not be destroyed, says the LORD. Is anything too hard for ME? I cannot be manipulated or controlled. I cannot be dictated to, detained, defeated or destroyed, and I Am on your side. I Am your defense. I Am your portion. I Am your designer, and I AM your destiny, says the LORD. Nothing can hold you back or knock you down, or push you back. You have ME, says the LORD. Did you forget that I Am with you? Do you not know that you cannot be destroyed? I have rebuked the destroyer for your sake, and he cannot mouth back at Me. There is no enemy that can defeat you, for your enemies are My enemies. I will bring you into your destiny, for it is what I have declared. I have ordained your life and you will fulfill every good purpose that I have created for you, because I will not be mocked, have not changed My mind, and My purposes for you will be accomplished without fail and on schedule, says the LORD. Let it be so in Jesus Name, Amen!!!! Lord you are indeed ny stability and my destiny! On schedule! Thank You Lord! Thank You My Lord! I trust in You! Yes, thank you Lord for your faithfulness to me in the storms of life. You sustain me and lift me up ~ I praise your holy name!